Scroll down for the online product list. The campaign led by the International Nestlé Boycott Committee primarily targets Nescafé, the corporation’s flagship product. 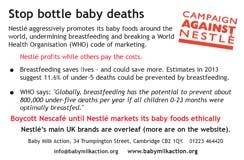 But we would encourage you to boycott all Nestlé products until the company stops marketing its babymilk in ways that undermine breastfeeding and break marketing rules. Here is a guide to Nestlé’s principal brands in the UK. You will also find brand information on the Nestlé website at http://www.nestle.com/ and on national Nestlé websites. Note: Nestlé breastmilk substitutes are not included on boycott product lists for the simple reason that there may be situations where these are the only products available for baby who is not breastfed and does not have access to breastmilk. If other bona fide breastmilk substitutes are available, there is no reason to choose a Nestlé brand over any other. For more on the reasons for the boycott, see the Nestlé-Free Zone. Credit-card size cards with the main UK brands on one side and a short explanation of the boycott on the other are available in our online Virtual Shop – click here. We also stock Nescafé – No thanks! and Nespresso – No thanks! cards. Click on the card to order – also see the Nestlé-Free Kit. Scroll down for the list on this page. IMPORTANT NOTE: We list products from which Nestlé profits. So Nestlé ice cream is listed because, although Nestlé sold the company, it continues to receive payments for use of the brand name (confirmed June 2015). Items marked with an * are either part-owned by Nestlé, such a L’Oreal, Lactalis Nestlé Chilled Dairy (a 60:40 joint venture between Lactalis and Nestlé, which owns Rachel’s Dairy) and Cereal Partners (a 50:50 joint venture with General Mills) or have been sold but there is an arrangement by which Nestlé continues to profit from them. No longer Nestlé: Body Shop, PowerBar, Branston Pickle, Crosse and Blackwell, Fox’s Glacier Mints, Gales Honey, Libby’s Juices, Sun Pat, Sarsons and Tartex may appear on old lists, but no longer have any link to Nestlé. Differences between countries: Findus and Haagen Daz have no link to Nestlé in the UK, but may have in some other countries. Some brand names below link to reports in our Boycott News newsletter giving more explanation. Some of these are hosted on our archive site. There is a report on own brand cereals manufactured by Nestlé’s Cereal Partners business in Boycott News 32. Last change – 8 September 2017: Body Shop removed. 7 August 2012: Rachel’s Dairy has been added to the boycott list following its move into the Lactalis Nestlé Chilled Dairy (LNCD joint venture). Lactalis purchased Rachel’s Dairy in August 2010 and recently announced its move into the joint venture. Lactailis owns 60% of the joint venture and Nestlé 40%. *Colgate Dental Gum was announced as a joint venture between Nestlé and Colgate Palmolive in 2003 as the start of a collaboration, but appears not to have progressed.